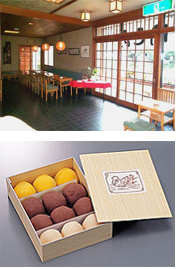 Kototoi Dango got its start at the end of the Edo Period. Our founder was actually a gardener in the Mukojima district near the Sumida River, and when customers came to call he would serve them dango that he made himself. Soon everyone was talking about how delicious his dango were, and before long he was in the dango business full time. Together with the beautiful scenery and the changing seasons, the wonderful flavor of Kotodoi Dango became an essential feature along the Sumida River. Dango are made from rice pounded into a glutinous state and shaped into dumplings. Kototoi Dango come with three different sweet toppings red bean paste, white bean paste and miso. We use only the choicest beans grown in Hokkaido for top flavor and aroma, and the highest quality rice, which is pounded to a silky texture that is a delight to eat.